Claremont, Calif. (December 7, 2012)—Assistant Professor of Biology Lars Schmitz of Pitzer College’s W.M. Keck Science Department and a team of researchers have discovered evidence of the first giant marine predator to stalk the seas in prehistoric times. The predator appeared after the massive extinction event that practically wiped out life on earth some 250 million years ago. Discovery of its existence gives scientists a window into the evolutionary chain of events that shaped today’s world. Unearthed in the high desert of northwest Nevada, the creature’s massive skull has large cutting teeth, indicating that it hunted other ichthyosaurs—aquatic reptiles known as “fish-lizards.” The 28-foot-long “macropredator,” now known as Thalattoarchon saurophagis, reigned at the top of the food chain in the sea the way carnivores such as T. rex dominated land creatures during the Jurassic and Cretaceous periods. Its scientific name means “lizard-eating ruler of the seas;” its unscientific name was “Jim,” in honor of the scientist who first spotted the fossil. 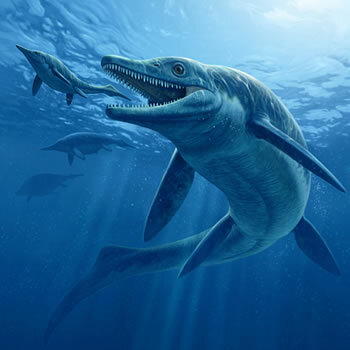 “Virtually all other ichthyosaurs were feeding on fish and marine invertebrates like clams and snails, but not on other ichthyosaurs, making the new ‘sea monster’ even more unusual,” Schmitz said. Occupying a similar niche as orca whales today, the creature was the first in a long line of macropredators in the seas of the Mesozoic and Cenozoic eras, such as marine crocodiles, archaic whales and great white sharks. The only other similar macropredator among known ichthyosaurs is the incompletely preserved Himalayasaurus, which lived later during the Late Triassic period. The remains were first discovered in 1997 by James Holstein and Olivier Rieppel of the Field Museum and Martin Sander, a professor of paleontology at the University of Bonn in Germany. The scientists weren’t able to collect the specimen at the time but a few years later, Schmitz and fellow researcher Nadia B. Fröbisch came across a description of the find in Sander’s field notes. Schmitz and Sander then traveled to Nevada to relocate the fossil. The Committee for Research and Exploration of the National Geographic Society provided funding for the excavation that began in 2008. Schmitz received another grant from the National Geographic Society in 2010 to continue the search for fossil marine reptiles in Nevada and will return to the area this fall to conduct more research. Schmitz describes the discovery in “A macropredatory ichthyosaur from the Middle Triassic and the origin of modern trophic networks,” an article he co-authored with Nadia B. Fröbisch, Jörg Fröbisch, P. Martin Sander and Olivier Rieppel. The article was published in the Proceedings of the National Academy of Sciences this week.